Hades uses the statue of Lincoln as his throne. 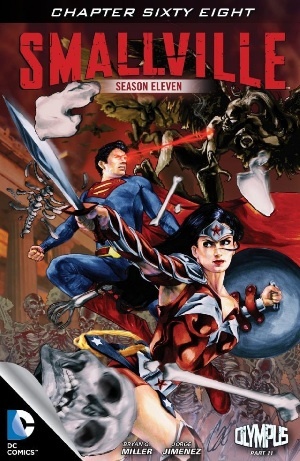 Wonder Woman makes her bloody way to him and is told upon her arrival that she cannot defeat him alone. That's when Superman shows up from underneath the giant zombie, toppling it. Hades summons harpies and zombies to defend him and Wonder Woman and Superman fend them off as Wonder Woman explains to Superman that Faust has to die in order to sever the "blood bond" with Hades. Superman says no and instead flies off with Hades into space, where he threatens Hades with "an eternity tumbling through the void." A terrified Hades yields and Superman hurls him back to Earth and down into the depths. Wonder Woman captures Faust with her lariat, the zombie creature falls, and Wonder Woman embraces Steve Trevor. No one knows what's coming next. Story - 2: Sorry, I don't buy it. Supes scares Hades into submission, throws him through the physical ground and back into "Hell" (i.e., Tartarus) and that's that? Not good enough, way too pat. But here's the deal: I'm not going to go all the way into it in this review. First of all, the concluding chapter may provide some of the kinds of things I'd like evidence were at least considered. Most of it, yes, concerns Hades. None of it concerns words as power and not killing, about which I will say a few things momentarily. Second is that I've been struggling to meet the schedule, and there's only so much I can do about that (thus also why this one is so brief). As far as the manner in which Superman defeats Hades in chapter 11 goes, I respect the words are stronger than punches trope. But, as tropes go, this one is at its most powerful when the opponent is inherently weaker than Superman - in those cases, it shows Superman's incredible control and restraint. It's why he is not only accepted but also trusted by the public. When the opponent is a being of Hades' supposed power, on the other hand, it rings more like a minor cop-out. But like I say, I'm holding my tongue until I see the wrap-up. Art - 5: I ran out of things to say about Jimenez's work weeks ago. Other than the giant zombie creature, which didn't much work, it's totally solid.